This small baler is ideal when space is limited and waste volume low. Bale weight 25-60kg. For cardboard, plastic and tins. This automated small versatile baler produces dense solid bales. Bale weight: 30-80kg. For cardboard, plastic and tins. A mid-range baler that compacts with ease. Bale weight: 150kg. For cardboard, plastic, tins and plastic bottles. A mid-range baler that compacts with ease. Bale weight: 150-220kg. For cardboard, plastic, tins and plastic bottles. A twin baler with 6 tons pressure, ideally for the recycling of plastic and cardboard. Efficient way of dealing with different materials at the same time. This low height baler excerpts 20 tons of force, compacting cardboard or plastic to a fraction of its size and produces bales of up to 300 kgs. 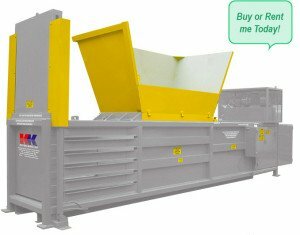 This heavy duty twin-chamber baler deals with volumes of mixed waste. Chambers can be added. Bale weight: 150-250kg. For cardboard, plastics and tins. Heavy duty mill-size baler exerting 50 tons pressure out performs any other mill-size baler. Bale weight: 450-600kg. For cardboard, plastic & tins. This semi automatic horizontal baler crushes anything that is offered to the wide loading hopper. Bale weight: 650kg. For cardboard, plastic, foam, barrels and more. For more than 35 years KK Balers has been selling compactors and balers throughout the UK and overseas. Our UK network of fully qualified technicians are always on call to ensure optimum performance of your waste compactor or baler. We aim to be onsite if not the same day, then within 24hrs. Buying a KK compactor or baler is a sound financial investment that will enable your company to save money on your waste collections, obtain revenue for your baled cardboard and plastic and conform to environmental legislation. Buying a compactor or baler from us gives you flexibility to allow you to choose which recycler you wish to collect your waste, this gives you the advantage of getting the best price for your card and plastic. To discuss further, please contact a member of the KK team on 01932 852423 or click on Contact Us and complete your details.